Whats the difference between Papa Louie Arcade and Flipline Studios? Flipline Forum > General > Help and Support > Whats the difference between Papa Louie Arcade and Flipline Studios? Just a quick question I've had for a while and never actually said anything about, why are there two websites, both http://www.flipline.com/index.html and http://www.papalouie.com/index.html ? Both are the exact same except the background, and if you go to the Forum or the Blog it reverts back to the green texture it is. Just something I was thinking about because I was browsing through old blog posts. Re: Whats the difference between Papa Louie Arcade and Flipline Studios? Oh so I read the story before on the Moterm, that actually was what I was doing and the reason I came across this website again but I didn't relise that Papa Louie Arcade WAS there sponser. Makes sense, thanks! ... Thanks, I wouldn't of known this without you. 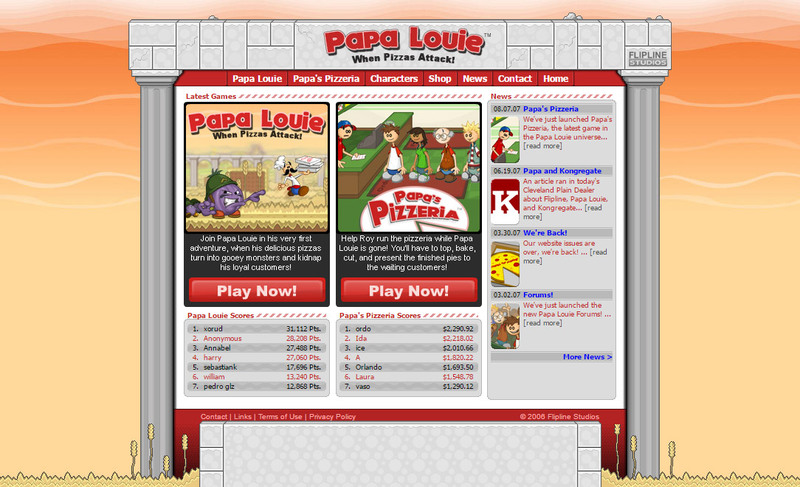 Eventually we focused on the Flipline site for all of our games, but the earlier Papa Louie games got really popular on their original site, so we ended up combining them. That way if people started playing on the Papa Louie site, they could still get to the games that way too. Now the only real difference is the logo and the background, and the "Papa Louie Arcade" takes the place of where a traditional sponsor would be advertising in the games. Could you guys still bring back the old version of the website? And still keep the today's version of the website? Like, having a link located some were in the today's website of Papa Louie Arcade? Here's the link for the old website. It was still available in 2010 ,but now active.